Rats are various medium sized rodents, similar in appearance to mice, but larger. "True rats" are members of the genus Rattus, the most important of which to humans are the black rat, Rattus rattus, and the brown rat, R. norvegicus. This genus is part of the family Muridae (Old World rats and mice). However, many members of other rodent genera and families are also called rats and share many characteristics with true rats. Rodents referred to as both rats and mice can be found in the families Cricetidae, Nesomyidae, Spalacidae, and Muridae. Although often regarded as agricultural pests, general pests, and vectors of disease—indeed, rats have spread serious diseases, consumed substantial amounts of food crops, gnawed electrical wires, and so forth—rats in general play important roles in laboratory research, ecological food chains, and as pets. Due to an incredible adaptability to almost any environment and a general ability to live symbiotically with humans, rats are regarded to be the most successful mammalian species living on earth today, followed by the mouse. Part of the difficulty is that some rat species, notably the black rat, have been spread by humans as invasive species into non-native habitats. In the broadest use of the terms rat and mouse, going beyond the specific genera Rattus and Mus, the main distinction between these two groups is a matter of size. Rats generally have bodies longer than 12 cm (five inches), and mice are similar looking animals that are perhaps 12 cm or less in size. Squirrels of most species are about the same size as rats but are members of their own rodent family, Sciuridae, and are usually more specialized than rats. As rodents, both rats and mice are characterized by dentition specialized for gnawing, including a single pair of upper incisors, a single pair of lower incisors, and a gap followed by one or more molars, as well as no canine teeth and nor more than one incisor in each quadrant (Myers 2000). Like most smaller rodents, true rats and most other rats mature rapidly and only live for a short time. The black rat reaches sexual maturity in 80 days; its longest recorded life was four years and two months (Nowak 1986). Most rat species breed several times each year and have multiple offspring. This lets their populations rapidly expand to take advantage of changes in their environments and also replaces individuals lost to predators. Most rats are omnivores, eating both plant and animal foods, and generalists, not bound to one specialized way of life. Among the exceptions to this are the mole rats of Africa (Bathyergidae family), especially the naked mole rat (Heterocephalus glaber), which are highly specialized and live almost their entire lives underground eating bulbs, roots, and tubers. The fish-eating rats of South America (Ichthyomys species) swim in streams to catch small fish. Kangaroo rats of North America (Dipodomys species) live in desert environments and do not need to drink; they get the water they need from the seeds and insects they eat. The marmoset rat of southeast Asia (Hapalomys longicaudatus) feeds mainly on bamboo and builds its nests in the bamboo stems (Nowak 1986). Among the largest rat species are the muskrat of North America (Ondatra zibethicus), which weighs 700 to 1800 grams (1.5 to 4 lbs) and the giant tree rat of New Guinea (Mallomys rothschildi). which can weigh as much as 2000 grams (4.4 lbs) (Nowak 1986). The genus Rattus, true rats, is one of the largest genera of mammals and includes as many as 78 species (Nowak 1986). True rats are native to southeast Asia, Australia, and the nearby islands. Some species build nests in trees, while others burrow into the ground. Most live in groups ranging from a few individuals to one hundred or more. Rats fight to establish dominance within the group, but rarely kill or injure each other. Sometimes females within a group will nurse each other's young (Barnett 2001). True rats are opportunistic feeders, eating seeds, fruit, vegetables, insects, other small animals. Most true rats live in forests or near rivers or other bodies of water. In Australia, some species live in grasslands and desert environments. Some species of rats, both true rats and rats of other genera, have become very successful by taking advantage of human activities. The black rat, Rattus rattus, which is naturally a tree dwelling species, has found nesting places and food in barns, houses, and other buildings and spread around the world with the the unwitting help of humans. The black rat was common in Europe by the time of the Roman Empire. It is also known as the roof rat and the ship rat. The brown rat, R. norvegicus, also known as the Norway rat and the sewer rat, is a ground dweller and naturally digs its burrows near water. It gradually spread out of Asia and reached Europe in the 1700s and North and South America soon after. Brown rats mostly live low to the ground, sometimes in city sewers. In some buildings, brown rats live in the basement and black rats in the attic (Barnett 2001). 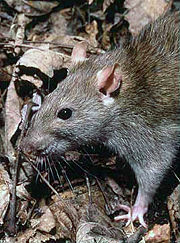 Other rat species that have come to live in close association with humans include the rice field rat (Rattus argentiventer) of southeast Asia; the Polynesian rat (R. exulans), native to southeast Asia and spread to the Pacific islands along with humans; the banicoot rats of India and Southeast Asia (Bandicota bengalensis, B. indica, and B. savilei); and the pest rat (Nesokia indica), which is found from Egypt to China (Nowak 1986). These commensal (which means "sharing the same table") rat species do a tremendous amount of damage to human interests, mainly by eating crops and stored food and by spreading diseases. It is estimated that rats and mice consume one fifth of the food crops that humans grow each year, including 50 million tons of rice (Voelker 1986). Rats can carry over thirty different diseases dangerous to humans, including Weil's disease, typhus, salmonella, and bubonic plague. Bubonic plague is caused by the bacteria Yersinia pestis and spread through the bite of the flea Xenopsylla cheopis. The plague bacteria and the fleas are common on wild rodents and often seem to do them no harm. When the disease spreads to commensal rats, especially the black rat, humans can be infected. In the Middle Ages plague outbreaks were common in European cities and sometimes killed 25 percent or more of an area's population. In the early twentieth century, plague killed around a million people a year in India and continues to be a problem today (Barnett 2001). Other damage caused by rats includes damaging dams and irrigation works by burrowing, causing power outages and fires by gnawing electric wires, contaminating food, damaging furniture and many other things. About 14,000 Americans are bitten by rats every year (Voelker 1986). Rats have also caused a lot of damage to natural environments to which they have been introduced. The black rat, which was introduced to many remote islands by early sailing ships, is listed as one of the world's 100 worst invasive species by the Invasive Species Specialist Group (ISSG 2007). 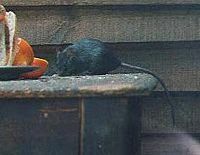 A variety of rat control methods have been used throughout human history to either reduce or eliminate rat populations in homes, markets, farms, and industrial sites. The two most widely used methods are poison and traps. Cats, dogs. ferrets, and even snakes have also been employed to hunt rats. Professional rat-catchers can be found in many developing countries and rat control is a big business world-wide. The domestication of rats started in England with the sport of rat-baiting, in which rats (mostly brown rats) were put into a pit and killed by dogs. Captive rats were bred to provide a constant supply of contenders. From time to time, a white or spotted rat would be born due to genetic mutation. These were bred with each other; changing their gene pool, allowing them to become popular as pets. In 1895, Clark University in Worcester, Massachusetts (United States) established a population of domestic white brown rats to study the effects of diet, and for other physiological studies. Over the years, rats have been used in many experimental studies, which have added to our understanding of genetics, diseases, the effects of drugs, and other topics that have provided a great benefit for the health and wellbeing of humankind. Laboratory rats have also proved valuable in psychological studies of learning and other mental processes (Barnett 2001). Domestic rats differ from wild rats in many ways. They are calmer and less likely to bite; they can tolerate greater crowding; they breed earlier and produce more offspring; and their brains, livers, kidneys, adrenal glands, and hearts are smaller (Barnett 2001). Domestic rat young and adults are sometimes used as food for captive reptiles. Rats, like all mammals, are edible by humans and are sometimes captured and eaten in emergency situations. Bandicoot rats are an important food source among some peoples in India and Southeast Asia. Among the reasons rat meat is not more widely utilized are the strong prohibitions against it in Islamic and Jewish dietary laws, the prohibition of all meat in Hinduism, and the rat's bad reputation in many cultures, especially as a carrier of disease. Pet rats, also called "fancy rats" (from the expression "rat fancy," not because the rats themselves are fancy in appearance), continue to be very popular. They are inexpensive, fairly easy to care for, active, intelligent, and can be friendly with humans. Among the other rat species sometimes kept as pets are the wood rats or pack rats of North America (Neotoma species), the giant pouched rat of Africa (Cricetomys emini), and the white-tailed rat of Africa (Mystromys albicaudatus) (Nowak 1986). 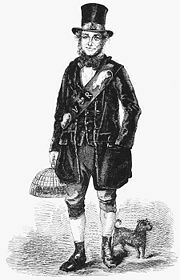 Charles Darwin Research Foundation  Eradication of Invasive species Black rats. Retrieved October 10, 2007. Invasive Species Specialist Group (ISSG). 2007. Global invasive species database: Rattus rattus Invasive Species Specialist Group Website Retrieved March 19, 2007. Myers, P. 2000. Order Rodentia (rodents). Animal Diversity Web. Retrieved January 30, 2007. Myers, P., R. Espinosa, C. S. Parr, T. Jones, G. S. Hammond, and T. A. Dewey. 2006. [Superfamily Muroidea (mice, rats, gerbils, and relatives. The Animal Diversity Web (online). Retrieved January 30, 2007 at http://animaldiversity.org. This page was last modified on 4 April 2008, at 00:28.